Fred Tim’s painful left hip was standing between him and the skiing, sailing and hunting he loved. So after having his hip replaced at Lehigh Valley Hospital (LVH)–Pocono, the Pocono Pines resident was happy to quickly get back to the ski patrol and shooting range. That’s a common sentiment, especially with the latest minimally invasive techniques for joint replacement, where an arthritic knee or hip joint is replaced with an artificial one. “We have a new approach to hip replacement that’s designed for faster recovery and fewer restrictions,” says orthopedic surgeon Roger Componovo, MD, chief of the Hip and Knee Replacement Program at LVH–Pocono and Mountain Valley Orthopedics. The advanced technique – called minimally invasive anterior total hip joint replacement – approaches surgery from the front of the hip joint as opposed to the lateral (side) or posterior (back), to avoid cutting major muscles. Instead, the surgeon works between the muscles, which promotes faster recovery and imposes fewer restrictions. Afterward, “patients are free to bend down and tie their shoes or move their hip in a more unrestricted manner,” Componovo says. And instead of spending days in the hospital, many hip replacement patients can safely go home the next day, and then undergo a month each of in-home and outpatient physical therapy. LVH–Pocono offers custom knee replacement as well. Using magnetic resonance imaging (MRI) and full-body X-ray, a 3-D reconstruction model of the knee is created so the surgeon can exactly match the knee replacement to the patient’s anatomy. If you notice your hips or knees are becoming stiffer or not moving the way they once did, it’s time to get an evaluation. Need an evaluation? 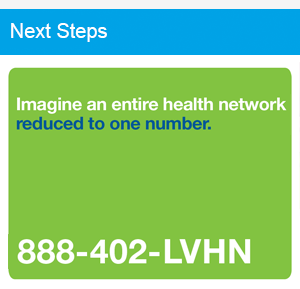 Make an appointment: Call 888-402-LVHN (5846). What Are the Symptoms of Ovarian Cancer? Esophageal Cancer: Should You Get a Screening?